The Samsung Focus Flash has a 5MP autofocus camera with LED flash. Still images have a maximum resolution of 2592 x 1944 pixels, while videos go up to 720p. The camera UI is pretty simple – you have your viewfinder and some controls on the right. From top to bottom they are the still/video camera toggle, virtual zoom buttons and an extended settings menu. We rarely get surprised by camera UI but Microsoft has managed to pull out another nice UI stunt here as well. A side slide to the right opens the last picture shot and a slide to the right brings back the camera's live view instantly. Interestingly, the camera key will wake the phone with a single press – that is unlock it and start the camera. But that feature cleverly doesn’t trigger if there’s something in front of the proximity sensor – like the insides of your pocket or purse. Despite its single-core CPU, we found the camera of the Samsung Focus Flash to be one of the fastest we have encountered. There is practically no lag in between taking pictures. Focusing is also very speedy. Unfortunately, the camera image quality is nothing spectacular. Colors and contrast are nice but the limited dynamic range and the lack of fine detail even at the lowest ISO setting are disappointing. We have prepared several sample photos for you. See them below. You can record in two resolutions – VGA or 720p. The camera defaults to VGA, which is frustrating – if you forget to set it to 720p, the videos you thought were shot in HD will be at the much less impressive VGA resolution. As of WP Mango though, you have the option of saving your favorite settings as defaults. The video quality is not far from what the still camera offers - which is not much. The videos are smooth but they lack fine detail. Here is a 720p video sample of the Samsung Focus Flash. Here goes an untouched sample 720p@30fps video clip so you can check it out without the YouTube recompression. The connectivity on the Samsung Focus Flash covers all the bases – world-trotting quad-band GSM/GPRS/EDGE and fast tri-band 3G with 14.4Mbps HSDPA and 5.76Mbps HSUPA. The local connectivity is covered by Wi-Fi b/g/n with DLNA support and Bluetooth 2.1 with A2DP. Bluetooth is currently limited as to what it can do – there’s no file transfer support. Syncing with a computer is done with the Zune app. It supports syncing over USB and Wi-Fi. It’s the only way to transfer files directly between your computer and your device – Windows Phone 7.5 doesn’t support Mass storage mode. 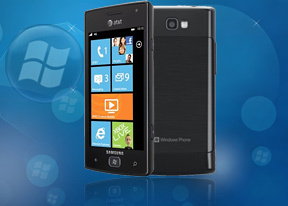 And if you have a Mac, don’t worry – the WP7 Connector for Mac will cater for Mac computer users with a Windows Phone 7 mobile. Another syncing option is the cloud. SkyDrive is a free Microsoft service that gives you 25GB cloud storage. You can even have your photos automatically uploaded as soon as you snap them. The Internet Explorer on Widows Phone was updated in the latest version of Windows Phone and it improves the user interface. The URL bar is always visible (but the status bar at the top of the screen is auto-hides, so you don't actually lose any screen real estate) and next to it is the refresh button. You can, of course, bring up the extended settings, which offer a great deal of options. The six tab ceiling hasn’t been lifted - it's not too bad, but competing OSes don't have such limitations. We were also hoping to see text reflow, but no luck on that either. Don't be afraid to pit the phone against even a desktop browser - the tests are pretty demanding and if you're not running a recent version of the major desktop browsers, your computer will surely break a sweat.